Wavelength Division Multiplexing, WDM, is a technology that increases bandwidth by allowing different data streams at different frequencies to be sent over a single optical fiber network. Signals at WDM wavelengths are independent from each other regardless of speed or protocol. Advanced WDM solutions from OSI Optics transform your network’s capacity instantly, making it capable of transporting up to 80 simultaneous traffic channels together at once. Intelligent WDM networking solutions by Smartoptics provide a simpler, cost-effective approach to your bandwidth expansion needs. Wavelength division multiplexing, WDM, has long been the technology of choice for transporting large amounts of data between sites and optimize optical network performance. Choosing between CWDM or DWDM? Which of the two key WDM technologies is best suited to a given environment depends on the network and user requirements. The two key WDM technologies are coarse wavelength division multiplexing, CWDM and dense wavelength division multiplexing, DWDM. Which solution is best suited to a given environment depends on the network and user requirements. CWDM supports up to 18 wavelength channels transmitted through a fiber at the same time. To achieve this, the different wavelengths of each channel are 20nm apart. DWDM, supports up to 80 simultaneous wavelength channels, with each of the channels only 0.8nm apart. CWDM technology offers a convenient and cost-efficient solution for shorter distances of up to 70 kilometers. For distances between 40 and 70 kilometers, CWDM tends to be limited to supporting eight channels. Unlike CWDM, DWDM connections can be amplified and can therefore be used for transmitting data much longer distances. The sweet spot for CWDM is up to 10 Gigabit Ethernet and 16G Fibre Channel. And it is quite unlikely capacities with increase beyond this in the future. DWDM however, is able to handle higher speed protocols up to 100Gbps per channel making it a more suitabletechnology for higher speed protocols. Traditionally CWDM components have been lower in cost making it more popular than DWDM. Now the price for both solutions is comparable. With higher speeds, more channel capacity, longer distances and passive networking, DWDM is the technology of choice for green field installations. Active or passive systems – what’s the difference? Both CWDM and DWDM solutions are available as active or passive systems. In a passive, unpowered solution the xWDM transceiver resides directly in the data switch. The output from the xWDM transceiver connects to an unpowered multiplexer that combines and redistributes, multiplexes and demultiplexes, the various signals. As the xWDM transceiver resides in the data switch, it means that all xWDM functionality is embedded in the data switch. Active xWDM solutions are stand-alone AC or DC powered systems separated from the switch. The task of the stand-alone system is to take the short-range optical output signal of the fiber or IP switch and convert it to a long-range xWDM signal. This OEO, (optical to electrical to optical), conversion is handled by a transponder. The converted xWDM signal is then transmitted with the help of transceivers and multiplexers. Due to the separation of the xWDM transport solution from the actual switch, active systems also tend to be more complex than passive, embedded solutions. A closer look at the most common ways of transporting data over a fiber network is by using single channel connectivity, embedded WDM solutions or active WDM platforms. 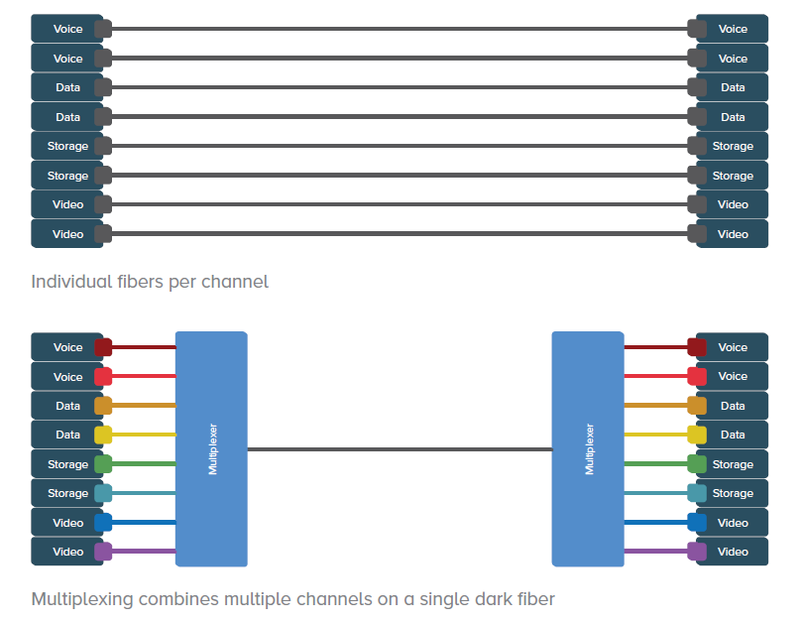 The most basic way of transporting data over a fiber network is through single channel connectivity, where individual traffic channels run over individual fibers. A single channel transceiver is connected directly between the data switches at each site with a line fiber connected between. The method is also referred to as ELWL, extended long wavelength laser, connectivity. 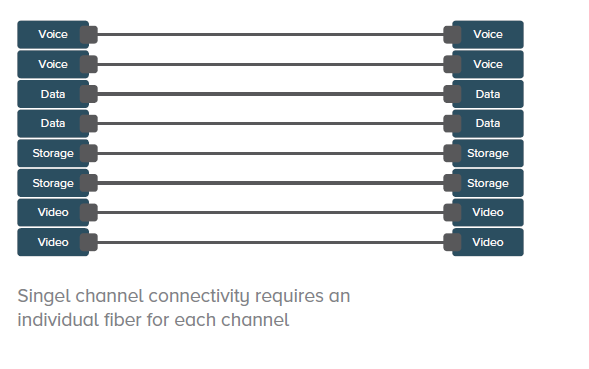 This non-WDM enabled approach requires access to a fiber for each and every service. And no other traffic can be transported through the fiber. This in turn means that the cost for adding additional channels increases linearly at the cost of renting additional fiber. Embedded XWDM represents an evolution from single channel connectivity. An XWDM transceiver is used instead of an ELWL single channel transceiver and connected directly to the data switch. Each signal is then connected to a multiplexer. With only these components, an embedded WDM solution is as simple as an ELWL approach to implement and manage. What’s more: The WDM solution allows multiple traffic signals to be transported over the same fiber, increasing the utilization of that fiber. New channels can be added to the embedded WDM system simply by connecting new transceivers. By deploying WDM technology, up to 80 channels of traffic can be connected together over the same fiber. ROI is realized when the second channel is added. Although a basic ELWL transceiver usually beats the embedded WDM components on price per unit, a WDM based solution is far more cost effective as soon as a second channel is required. Embedded WDM offers simple, easy to manage and cost efficient solutions for transporting large amounts of data over short to mid-range distances, typically up to 80 kilometers. Since no additional power is required for the embedded components the solutions are also preferred for creating green datacenters. Active XWDM solutions are stand-alone AC or DC powered systems, separated from the switch. In an active solution a transponder takes the output from the SAN or IP switch and converts it to a longer distance XWDM signal. After this OEO conversion, the long distance XWDM signal is transmitted through transceivers and multiplexers. To support management and control of the active, stand-alone, WDM solutions they usually come with a GUI-based management interface. This makes an active, transponder based solution a powerful platform for transmitting huge amounts of data between different sites over short or long distances. A drawback of active systems: OEO conversions tend to incur unwanted latency. Traditionally active WDM systems were designed for dedicated carriers and service providers. In most cases neither the capacities nor the advanced feature-set of a traditional active WDM solution is required for corporate use. This makes an active system not only unnecessarily complicated to design, install and configure from an enterprise point of view, but also expensive to own and maintain. 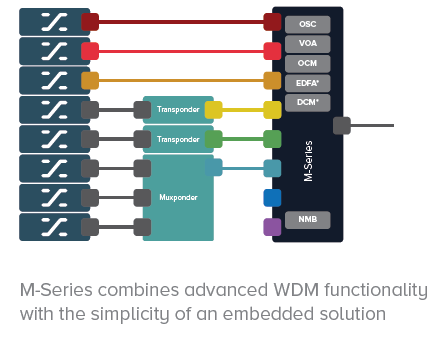 Traditionally, enterprises and corporate datacenters have opted for the embedded approach to WDM solutions, offering similar capabilities to transmit a vast range of channels over a single fiber, at a fraction of the cost of an active system. Having recognized that an active WDM system in most cases is far too much compared to what is needed for enterprise use, these systems do offer significant benefits over passive systems in terms of system management and signal amplification for longer distances. An ideal WDM networking solution for corporate datacenter connectivity should combine the simplicity of a passive, embedded solution with the value-adding features of an active WDM platform. Smartoptics M-Series marks a revolution in fiber optic networking solutions. M-Series is a unique 1U multiplexer platform that combines the simplicity of a passive multiplexer with the features of a more traditional transponder-based DWDM platform. A multiplexer with integrated channel monitoring, amplification and signal conditioning. It easily handles all of today’s data protocols up to 100 Gbps per channel in a simple plug and forget approach.